Patiala is famous for "Peg", "Pagri", "Paranda" and "Jutti", Joyous buoyance, Royal Demeanor, Sensuous and Graceful Feminine gait and Aristocracy, Patiala presents a beautiful bouquet of life-style even to a casual visitor to the city. A brilliant spectrum of Rajput, Mughal and Punjabi cultures, a fine blend of modernity and tradition and a judicious synthesis of all that is beautiful in form and bold in spirit conjure up a vision called "PATIALA". Patiala,an erstwhile princely state, capital of PEPSU and a district headquarters of Punjab are situated in the Malwa region of Punjab. Malwa has the largest number of districts in the reorganised Punjab, and antiquity of some of the cities goes back to the ancient and early medieval period. Patiala is relatively a young city, a few years more than two centuries old. In the 18thcentury, the political vacuum created by the downfall of the Mughals was successfully filled up by the Sikh Misldars in Punjab by thwarting the designs of both the Marathas and the Afghans. One among these independent principalities of the Sikhs was that established by Baba Ala Singh at Patiala. Patiala image The early history of the founders of Patiala state is more of a myth mystery than reality. The rulers of the erstwhile states of Patiala, Nabha and Jind trace their ancestry to one Chaudhary Phul. Apparently the appellation of dynasty 'Phulkian' is derived from their common founder. One of his sons, Chaudhary Ram Singh was baptised and blessed by Guru Gobind Singh. His son Ala Singh assumed the leadership in 1714 A.D. when Banda Bahadur was engaged in the fierce struggle against the Mughals. 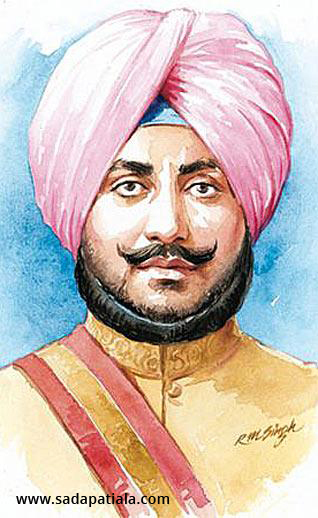 A man with vision and courage, Ala Singh carved out an independent principality from a petty Zamindari of 30 villages. Under his successors, it expanded into a big State, touching the Shivaliks in north, Rajasthan in the south and upper courses of the Jamuna and the Sutlej. 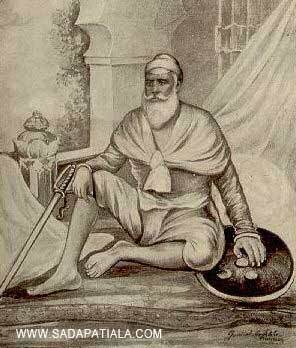 While confronting the most trying and challenging circumstances in the middle eighteenth century, Baba Ala Singh, unlike many of his contemporaries, displayed tremendous courage and shrewdness in dealing with the Mughals, Afghans and Marathas, and successfully established and maintained a state which he had started building up bit by bit from its nucleus Barnala. In 1763 Baba Ala Singh laid the foundation of the Patiala fort known as Qila Mubarak, around which the present city of Patiala is built. After the third Battle of Panipat in 1761 in which the Marathas were defeated, the writ of the Afghans prevailed throughout Punjab. It is at this stage that the rulers of Patiala began to acquire ensigns of royalty. Ahmad Shah Abdali bestowed upon Ala Singh drum and banner after latter's death, his grandson Amar Singh, succeeded and received the title of Raja-i-Rajgan. He was also allowed to strike coins, After forty years of ceaseless struggle with the Mughals, Afghans and Marathas, the borders of the Patiala state witnessed the trailing blaze of Ranjit Singh in the north and that of the British in the east. Bestowed with the gift and instinct of survival, and of making right choice at the right time, the Raja of Patiala entered into a treaty with the British against Ranjit Singh in 1808, thus becoming collaborator in the grand empire building process by the British in, the sub-continent of India. The rulers of Patiala such as Karam Singh, Narinder Singh, Mahendra Singh, Rajinder Singh, Bhupinder Singh and Yadvindra Singh were treated with respect and dignity by the British. Though historians have tried to trace the origin of Patiala (as far as the name is concerned) to Rig Vedic literature yet the town as it stands today was founded by Ala Singh with the construction of the Qila Mubarak in the year 1763. One gets the impression as if the city was designed and developed according to a plan akin to that of temple architecture. In the heart of the city was the seat of the king similar to the house of the deity and the residential areas of communities developed almost status-wise. Close to Qila Mubarak were the Mohallas of the Khatris, Aroras, Baniyas along with the big Havelis of the nobility, The first settlers of Patiala were the Hindus of Sirhind, who opened their business establishments outside the Darshani Gate. The lower caste got settled on the peripheral areas of the Patiala city now known as Chur Majris. As in all the medieval towns, there were separate localities of dancing girls. Dharampura Bazar was one such in Patiala, which was frequented by the ruling elite. In the late nineteenth century, the ruling class having been granted huge Jagirs became rich and started constructing huge mansions with sprawling lawns. Some of the buildings though shabbily maintained, stand as mute evidence of that feudal glory. Maharaja Narendra Singh (1845-1862) fortified the city of Patiala by constructing ramparts and ten gates around the city. Some of these gates have been demolished to facilitate the flow of traffic. Inside the walls, besides the residences, there are Mandis and Bazars and a visitor with meagre amount in his pocket can still indulge in the luxury of purchasing traditional goods famous for their art and beauty such as embroidered Jutti and Phulkari.